What Is the Purpose of Schedules? What Should Be the Frequency of Source Refresh Schedules? What Should Be the Frequency of System Schedules? Incremental refresh is a feature that is available for most connectors. It allows your to efficiently keep a source up-to-date by re-indexing at short time intervals only the documents reported by the repository to be new, modified, or deleted since the last incremental refresh. Once a source is created and indexed at least once, you must manually set an incremental refresh schedule for your source. A scheduled Full Refresh/Rebuild automatically stops a running Incremental Refresh before starting. A scheduled Incremental Refresh is ignored while a Full Refresh/Rebuild is running. CES 7.0.6942– (August 2014) You cannot add or delete a schedule while a source is being indexed. Access the Sources and Collections page (Index > Sources and Collections). In the Collections section, click the collection that contains the source for which you want to configure the incremental refresh schedule. In the Sources section, click the appropriate source. In the navigation panel on the left, select Schedules. Click Add to create a new schedule or click an existing one to modify it. In the Action drop-down list, select Start. In the Type section, select Incremental Refresh. Note: When the Incremental Refresh option is not present, the source type does not support incremental refresh. In the Schedule drop-down list, select an appropriate time interval for the incremental refresh (see What Should Be the Frequency of Source Refresh Schedules?). 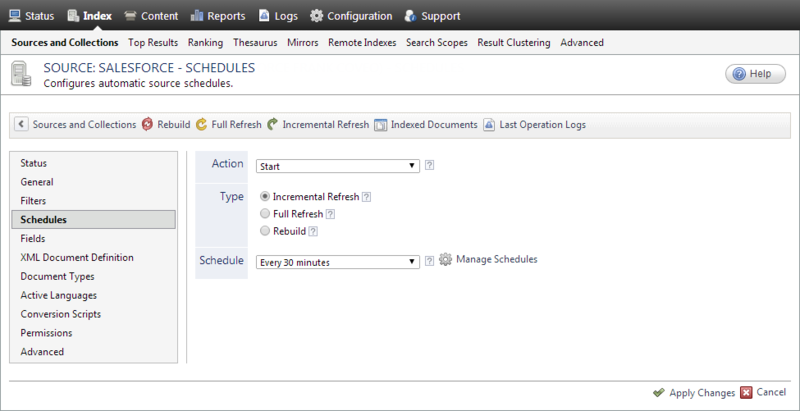 Note: Click Manage Schedules to modify existing refresh schedules or create new ones with time intervals that are more appropriate to your environment (see Creating or Modifying a Source Schedule). Example: When a repository indexed by a source is offline, it is recommended to disable incremental refresh to prevent unnecessary unsuccessful connection attempts to the repository. In the Collections section, click the collection that contains the source for which you want to disable the incremental refresh schedule. In the Schedules page, at the end of the line for the schedule that you want to disable, click [Disable].